I will be submitting a report to the National Science Foundation. If I could include a sentence or two on the use (and growth of use) of the miniFEA program that would be great. Can we look at it briefly tonight? I am sure that appropriate compensation can be found. Clearly a broken tag — it broke on August 8, six months ago. I had to do all sorts of Excel exporting and graphing of less important pages to get a proxy for the traffic. 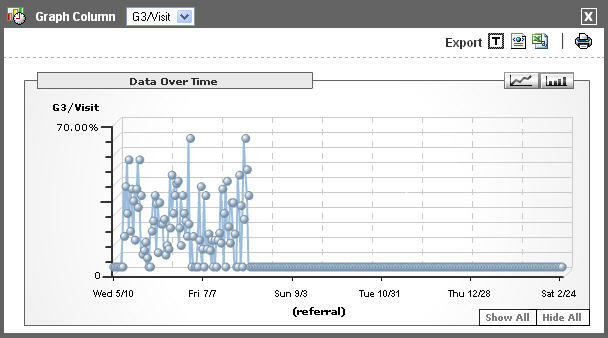 From this we learn, look at your web analytics fairly often (so that you can catch stuff like this.) Lecture your web developer that you will one day care about your WA, so please don’t break tags, and be especially careful (dear web developer) with sites and pages that don’t allow you to just throw the analytics into an include file. And finally, don’t send email like this to your wife if she is a blogger. My spouse: I can’t believe you are going to publish that. I am supposed to be a serious academic. My cover will be blown. That wasn’t even what I was shooting for.